Please find enclosed a copy of an email sent to officials at your department yesterday. The People’s Energy Charter is a network of groups and non governmental organisations with an interest in Ireland’s energy. We are calling for comprehensive public participation in the development of Ireland’s energy policy, plans and projects as is our right protected by the Aarhus convention. A list of affiliated groups is attached. that the process of educating and engaging the community sector needs to be resourced realistically to attain our common objectives. We agree that we can hold each other to account based on these reference principles and understandings. We feel that working within these principles will enable all parties to engage in a meaningful and committed way to Irelands energy transition. We respectfully request that you endorse this overall proposal and make whatever resources you can spare, including staff committed to public participation, available so ensuring it’s success. CEF – Cork Environmental Forum is a not-for-profit local agenda 21 organisation that promotes sustainable development in County Cork. COF – Claiming our Future is a national non-party-political civil society network that comprises individuals and organisations from a broad range of civil society sectors. Established in 2010, we aim to make real the values of equality, environmental sustainability, participation, accountability and solidarity. FOE – Friends of the Earth Ireland campaigns for environmental justice and sustainability. We believe in sustainable development – meeting the needs of the current generation without compromising the ability of future generations to meet their needs. GEAI – Good Energies Alliance Ireland works through research, advocacy, education and campaigning to influence public opinion and decision-makers in Ireland against on-shore unconventional hydrocarbon development and towards practical policies on energy sources and uses that respect the environment, the planet and people. LEAF – Laois Environmental Action Forum Regional Transition Hub addressing the challenges of climate change, resource depletion and economic contraction. Raising awareness, networking and supporting environmental stewardship and true sustainability in Laois. LEN – Laois Environmental Network consists of current and past environmental representatives in Co Laois working together on policy and issues relevant to their respective boards – Laois Partnership Company, County Development Board, Environment and Planning Strategic Policy Committee. POW – People Over Wind are a community group who are concerned with the size and scale of proposed wind farm developments in the Midlands area and the serious negative impacts on both residents of and visitors to these areas. Presentation Justice Network Ireland is part of an international network through the International Presentation Association (IPA) which has contacts in 26 countries where sisters, associates and co-workers collaborate on issues of justice and human rights. The Network has consultative status with the Economic and Social Council of the United Nations and a full time representative at the UN. Formed in 2009 in response to Eirgrid’s proposed Coolnabacca Substation and new 400 kva and 110 kva power lines. Concerned citizens seeking to participate. TINI – Transition Ireland and Northern Ireland is affiliated to a worldwide initiative building community resilience to face the effects of climate change, peak oil and economic contraction. Transition originated in Kinsale, Co Cork and there are initiatives located throughout Ireland, networked through TINI. Transition Kerry – Southwest Transition Hub is part of a local, national & international initiative. It is making an effort to get local communities to think about making themselves more resilient, in response to three major challenges in our world: Climate Change, Peak Oil and Economic Change. Transition is about creating awareness and networks to ensure that local sustainability is at the core of all actions and decisions made at local, national & international levels. 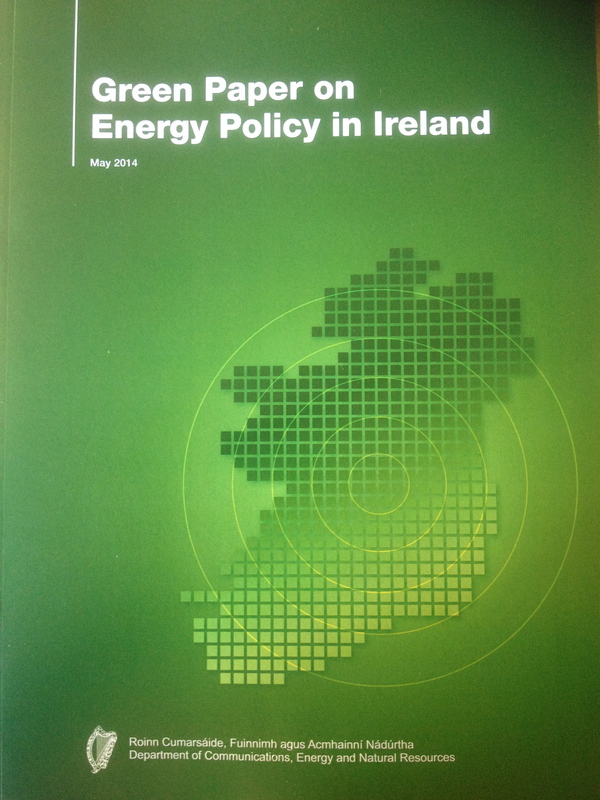 Wind Aware Ireland are working to change our Governments flawed policy on wind energy. We believe all wind energy projects and associated grid development must prove they are environmentally, economically and socially sustainable before we proceed with any further development of this sector. The Environmental Pillar, a coalition of 27 environmental non governmental organisations, are currently voting on a decision to work in conjunction with PEC to pursue comprehensive public participation in Ireland’s energy policy. At our meeting with you and your colleagues on 2nd April it was agreed that PEC would come back to you with suggestions for developing effective public participation in Irish energy policy. A prototype consultation process to get the ball rolling – learning by doing – is set out in Annex C.
Mindful that the Green Paper is about to issue it is worth reiterating the views we expressed at our last meeting that the ‘written submissions’ consultation process envisaged for this is entirely inadequate to the needs of the times we are in. We are hopeful that DCENR will revisit this and demonstrate a willingness to explore ways for a more meaningful engagement with civil society, not just for the future, but in relation to the Green Paper process itself. The transition to a decarbonised economy presents a systemic challenge and the response needs to be multi-layered and systemic in nature. As with the Constitutional Convention a major learning is the need to prime the process with information/education that allows participants to be as fully informed as possible about the issues involved. This entails realistic resourcing. As you will be aware NESC are doing important work on the question of public engagement and some of our group have been in consultation with them on the topic. We believe their input could be very valuable as we seek to craft a way forward in this new territory of embedding community engagement. They could also be a possible partner in seeking funding under category 4 of section 5 of the SEAI’s Energy Research, Development & Demonstration (RD&D) Programme. We believe it’s important to make progress in a constructive and pragmatic manner as quickly as possible. Can you suggest dates that would be suitable for a meeting and we will canvass availability of people to attend from PEC and the Environmental Pillar, who have committed to engage with this process. The suggested agenda for such a meeting is to agree the understandings and working principles to inform the process of engagement and to discuss how to make concrete progress in developing the process itself. I look forward to hearing from your shortly. Security and reliability of energy supply. Invitation: DCENR and the Environmental Pillar/PEC jointly convene a workshop ‘Fresh Thinking on Public Participation in Energy Transition’; [Question for consideration: do we need anyone else as part of the ‘calling team’? Format: (i) begin with some brief presentations on a few models from elsewhere; (ii) World Cafe process (engaged conversation) around the principles we would want to take from that to be effective in Ireland; (iii) Open Space process to facilitate conversations designed to progress the whole field of public participation in Energy Transition forward. NOTE: We can come back with a clearer pro-forma structure once we have fleshed out the questions posed above and any other questions you want to add to the mix.